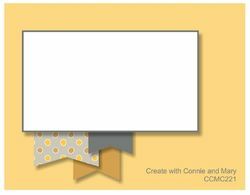 I had a bit of spare time this evening so I decided to make a card for this week's color challange at Create with Connie & Mary. 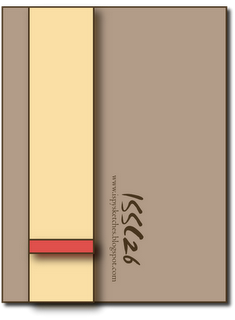 I really like these colors together and decided to go clean and graphic for this card. For this card, I used the Timeless Type Sizzlets to die cut the word "Thanks". This took a slightly larger than usual card base to fit on. 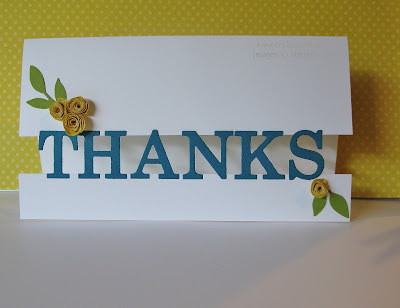 I cut an inch off the bottom of the card front and positioned the letters across the top. I then lined up the top of the letters and adhered to the shortened card base. 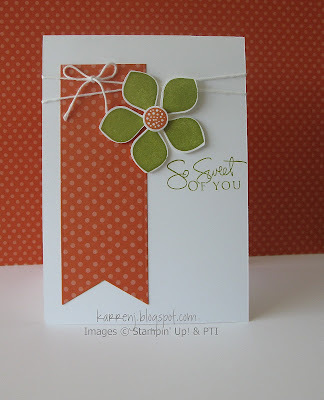 A few rolled flowers in Daffodil Delight and a couple of leaves and the card is finished. Edited to add: This card was chosen as a Top 3 pick at Create with Connie & Mary. 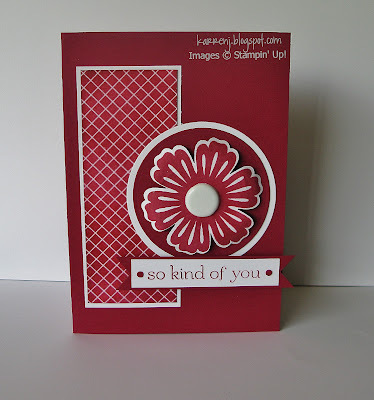 While I had the Raspberry Ripple cardstock and Mixed Bunch stamp set out for my last card, I couldn't resist using it all again for the sketch at CAS(E) this Sketch. For this flower, I used a whole heap of pearls in three different sizes for the center. Again I curled the edges of the petals to give it a bit more dimension. 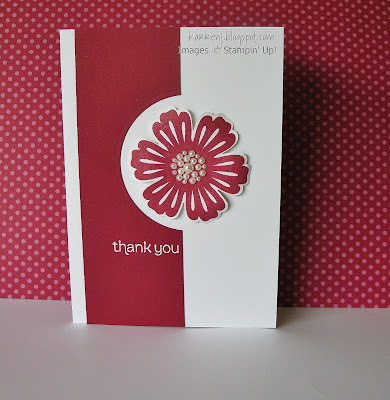 The sentiment is white embossed, with the bonus being that the Raspberry Ripple ink stayed wet long enough to emboss. I have very little luck using Versamark with small images as the stickiness of the ink generally causes the stamp to fall off the block. I used this gorgeous card on Beth Beard's blog as inspiration for my challenge card for Freshly Made Sketches. 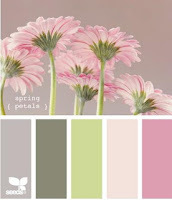 Raspberry Ripple is such a lovely, rich color and pairing it with Whisper White really shows off its lushness. I stamped and punched the flower then curled the petals down. For the center I used a retired 5/8" white brad. The flower is popped up on two layers of dimensionals. The DSP layer is the retired Presto Patterns sponged in Raspberry Ripple. I don't have any Raspberry Ripple embellishments so I punched two tiny circles and positioned them either side of the sentiment. 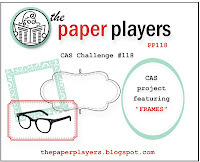 This week's challenge at Paper Players is a CAS card featuring frames. 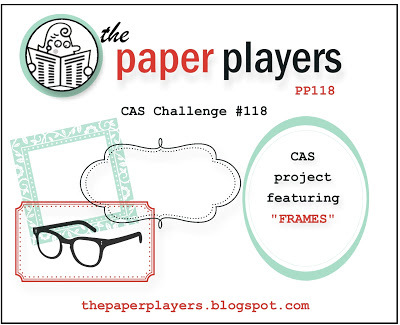 I went the obvious route and used the Designer Frames Embossing Folder. I used a new-to-me set called Watercolor Winter and stamped that onto a piece of Very Vanilla cardstock cut to fit inside the Designer Frames EF. The sentiment comes from More Merry Messages and was colored with Early Espresso and Cherry Cobbler markers. Some gorgeous Lucky Limeade paper from the Candlelight Christmas DSP, along with some Cherry Cobbler Seam Binding ribbon finished off the card. Edited to Add: This card was chosen as a Cut Above card over at Paper Players this week. This card was quite quick to come together. I stamped one of the images from Clockworks twice in the upper left of the Basic Gray card base. 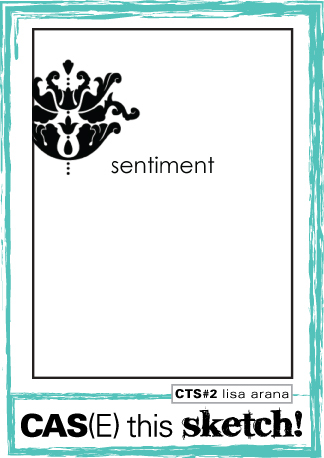 I then stamped the sentiment from Sweet Essentials. The spritzer tool was put to good use spritzing some Basic Gray ink in a diagonal from top left to bottom right. I then stamped the shell onto Whisper White cardstock using Marina Mist ink, cut it out and popped it up on dimensionals. 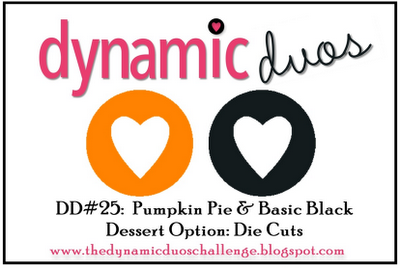 Here is my card for this week's Dynamic Duos color challenge, which was to use Pumpkin Pie and Basic Black. I had fun with this card. 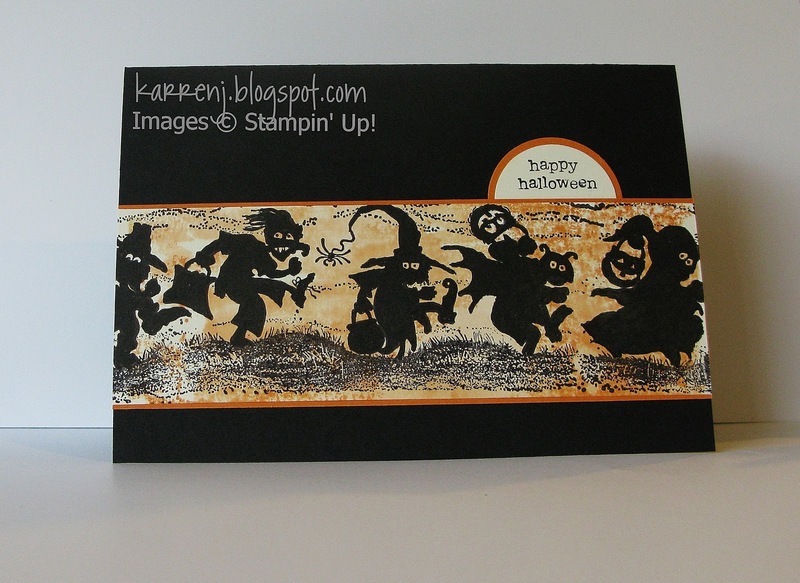 I was playing around with using the acrylic block as a stamp and decided to use Pumpkin Pie as my color of choice. 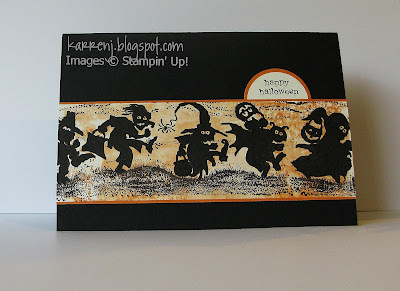 Once I'd colored onto the block using a marker, I spritzed the block with Champagne shimmer mist then stamped onto some Very Vanilla cardstock. So it's nice and sparkly IRL. Once that dried for a few minutes I ran over it with my Haunting wheel inked in Basic Black ink. I colored over each little trick or treater using Basic Black marker to sharpen the image. 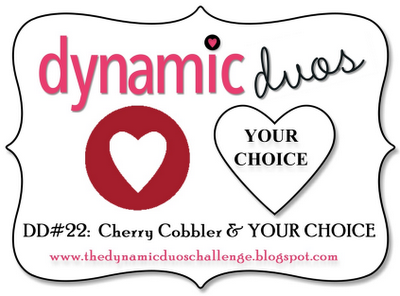 Edited to add: This card was chosen as a Dynamic Darling over at Dynamic Duos this week. 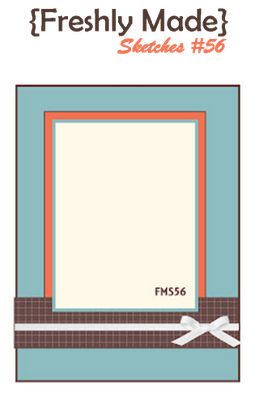 I love the color combo at Fab Friday. 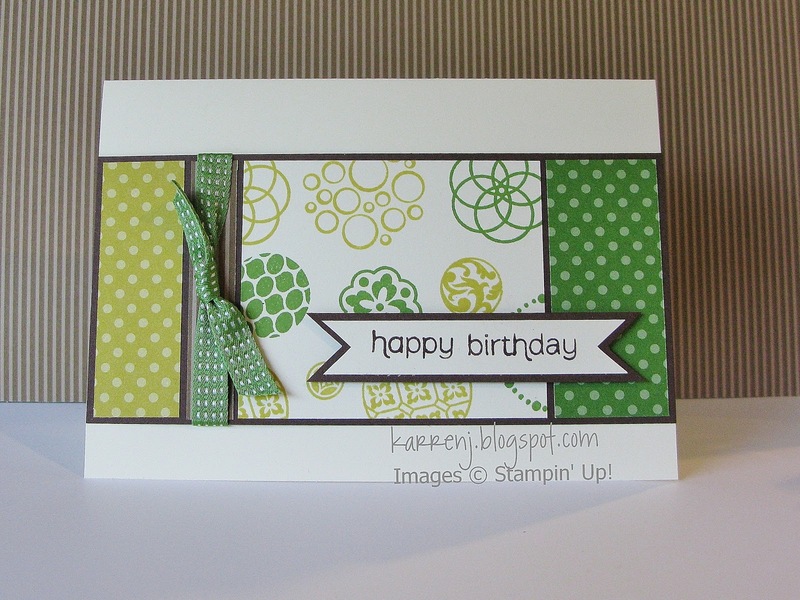 These colors go so well together, but I have to admit I struggled a bit with how to put them together until I decided to go with an embossed and sponged card. 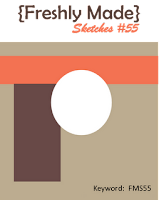 I used last week's sketch at Friday Mashup for the layout. The sentiment is from Grunge Rock and I scored around the banner. I think this will make a good birthday card for my oldest son, who will be 15 in December. My older sister is celebrating a milestone birthday next week. I won't tell you how old she is, because that just wouldn't be right (but check out the card...LOL). I decided to do something a little more detailed than I usually do, so I used the Mojo Monday sketch as my inspiration. I can't remember the last time I produced a card with so many layers! 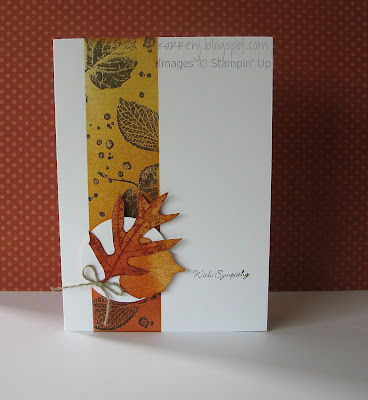 I also used the inked embossing folder technique again, so I'm linking to Hand Stamped Sentiments as well. That technique really provides another level to embossed panels. I used my favorite DSP in the new SU catalog - Fan Fair. Love that paper! The sentiment is from the Made For You set, which has such a cool font. I only wish there were more stamps in the set! Happy Birthday for the 27th, Jannene! This is my first time using this lovely stamp set, Cherish Friendship. 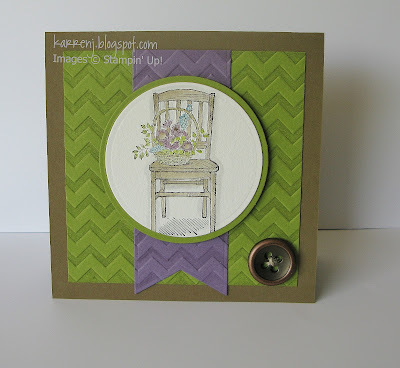 I combined several challenges in producing this card: the sketch challenge at iSpy Sketches; the chevron challenge at Just Add Ink; the color challenge at Color Me Beautiful and the inked embossing folder challenge at Hand Stamped Sentiments. 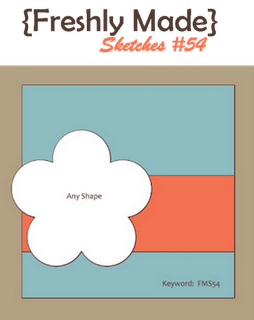 The sketch is actually rectangular but I changed it to a square card as the chair image is actually quite large. I watercolored the image using markers and blender pens and managed to get in all the colors in the challenge. The chevron layers were inked in their matching colors using a brayer then run through the embossing folder. I made sure to line up the chevrons between both layers. 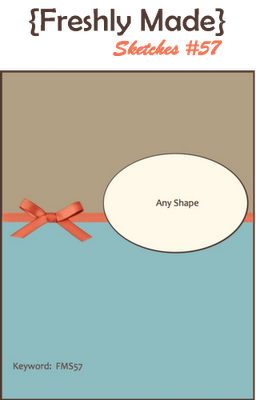 To finish the card off, I attached a button to the bottom right hand corner. I think this is the first time I have ever voluntarily used Melon Mambo! 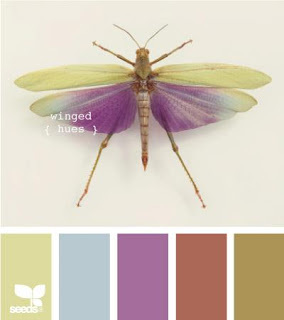 Apart from Old Olive, I'm just not a Brights kinda gal. 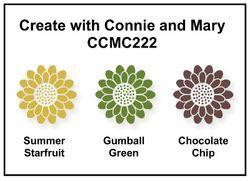 I took inspiration from my friend Vicki who made some fantastic ornaments using Melon Mambo. 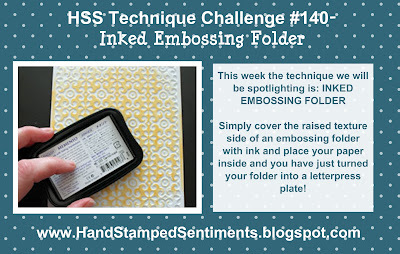 I used Vicki's great idea of stamping the ornament on top of the piercing mat to get better ink coverage. I created a 3-D ornament and tied it with silver cord. I then pierced around the top of the ornament using the Festive Paper Piercing Pack. The sentiment is silver embossed and the ribbon is retired. Here is my submission for the color challenge at Create with Connie & Mary. I used a sketch from the Clean & Simple blog from a few weeks ago. I pulled out Circle Circus and chose the non-flowery images for this masculine birthday card. 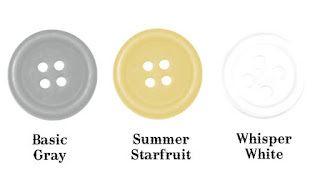 I randomly stamped in Summer Starfruit and Gumball Green onto Very Vanilla. I then used some DSP for the panels and layered onto Chocolate Chip. The sentiment was originally on two lines, but I used my Stamp-a-majig to make it a one-liner. This card fought me all the way. I had to work on it over two days because it was frustrating me so much! I knew what I wanted but it just wasn't coming together. Even now it doesn't look quite right to me but I refuse to spend any more time on it LOL. 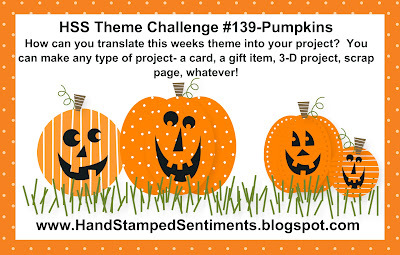 I'm entering this card into both the Freshly Made Sketch challenge and the challenge at Just Add Ink, which is to use something new. The JAI challenge came at a perfect time because on Thursday I received a rather large demo order, plus my class order, which of course I had to add to (I admire demos who can put in an order without adding just a little something to it...) Anyway, suffice to say, I now have buckets of the promotion ribbon! In my order was the Snowflake Soiree set, plus the 3 builder wheels that match. This is also the first time I've used Raspberry Ripple in a significant way. And I've been hoarding that silver glimmer paper. Actually, I'll let you in on a little secret. I'm so frugal with it, that I cut the inside of the rectangular frame and used it for the snowflakes. I'm convinced the word "Merry" is crooked, but it was really hard to decide which angle was straight. I lined up the "err" but the "y" seems to be a bit higher. Next time I'll try lining up the top of the "rry" and see if that looks better. Here is my second card today. 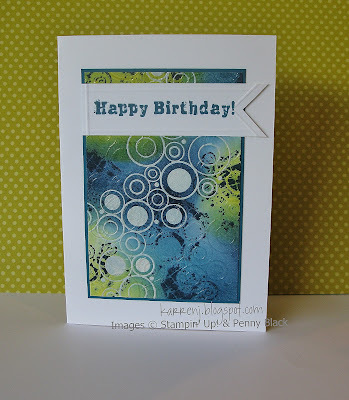 This card covers the color challenge at Pals Paper Arts and the free-for-all sketch challenge at iSpy Sketches. 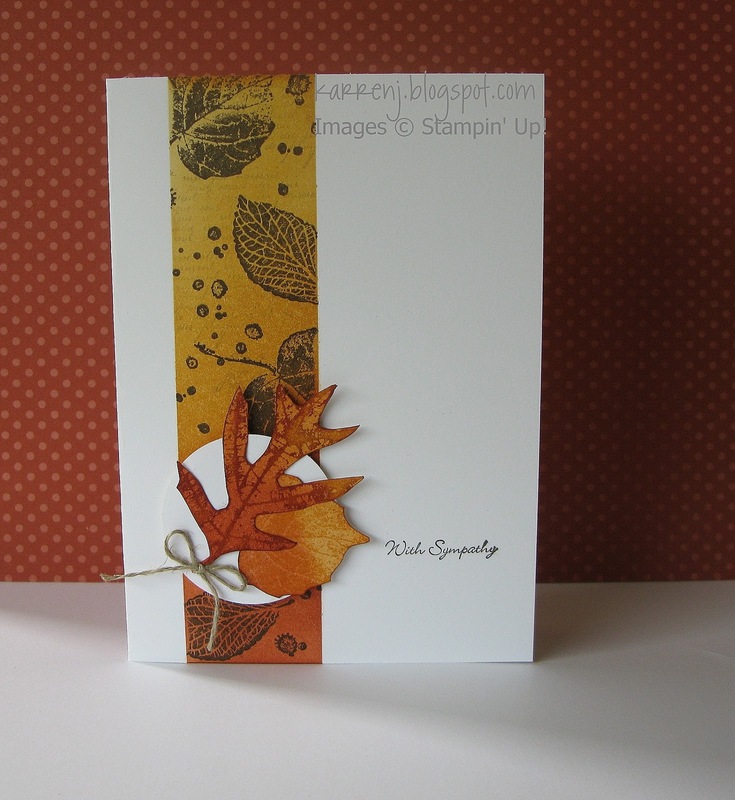 I used sketch 26 from iSpy and chose to go with a masked sponged panel and a couple of cut out leaves for embellishments. I masked the card base and then sponged More Mustard in varying degrees of intensity. From about 2/3 down the panel I sponged Cajun Craze from light to dark. With the masks in place, I then stamped the text stamp from French Foliage in Crumb Cake randomly over the panel, followed by leaves and splatters using Early Espresso ink. The cut out leaves were colored using markers and then sponged over the top. I used the side of my Cajun Craze marker to outline both leaves. To make them stand out a bit more from the sponged panel I popped a 1 3/4" circle underneath. Today marks the beginning of a 5 day weekend for me - yay! Having said that, I have a whole heap of chores to do and I've just found out the insurer is planning on digging up our driveway and path tomorrow as a result of the earthquake damage from Sep 10 and Feb 11, so it's going to be headache material around here, methinks! Anyway, while it's quiet I managed to make a card for the sketch challenge at Fab Friday and the theme challenge at Hand Stamped Sentiments. We don't celebrate Halloween, but this cute kid just needs to be stamped and colored. 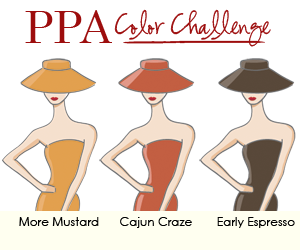 I used the color coach for colors that worked with Pumpkin Pie and it gave me Daffodil Delight and Early Espresso. I substituted Basic Black for the Espresso and I quite like the contrast. I colored my girl with markers and blender pen then cut out and mounted onto a Basic Black layer. Once I had the banners and stamped image on the card, I decided to add some little rolled roses and leaves as embellishments. This is my last card of the day (and weekend). 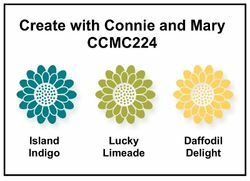 I really wanted to use the sketch from Create with Connie & Mary before the challenge closed as well as the color combo at Color Me Beautiful. With that in mind, I decided to go fresh and clean and pulled out one of my oldest stamp sets Definitely Decorative Daisy. Hmmm, doesn't look very fresh and clean, does it? Once I had the main panel stamped, I thought it was lacking something. 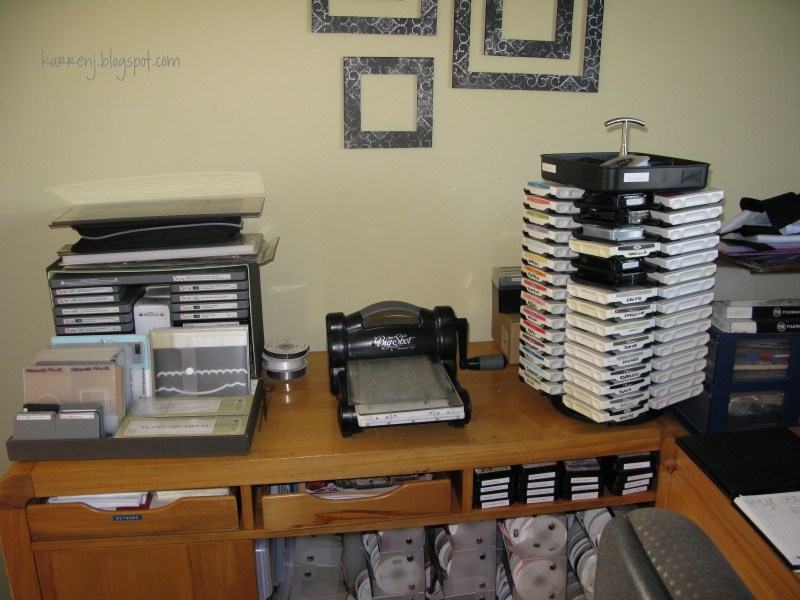 So I dug around in one of my plastic tubs of rarely used stamps and pulled out my Linen background stamp. 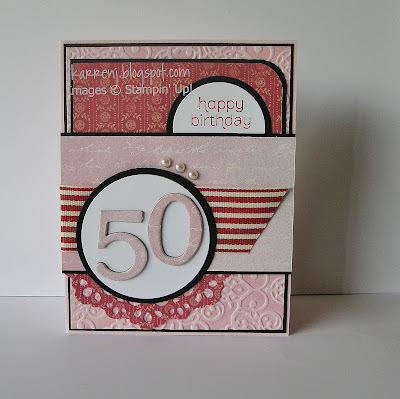 Once I'd stamped over the main panel, my card was going to be anything but fresh and clean, so I decided to go all out and try and meet the criteria of texture over at SUO Challenges. I textured everything! 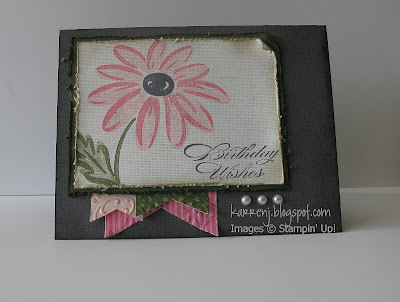 Using either Linen background, the distressing tool or the Finial Press Embossing Folder, it was textured LOL. The daisy was stamped using Pink Pirouette stamped full strength and Regal Rose stamped off. The leaves were Always Artichoke full strength and then stamped off. The only color I didn't use was Certainly Celery. 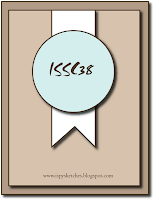 The banners were embossed then lightly sponged with Crumb Cake ink to highlight the embossing. The ends were curled slightly to add to the texture theme. 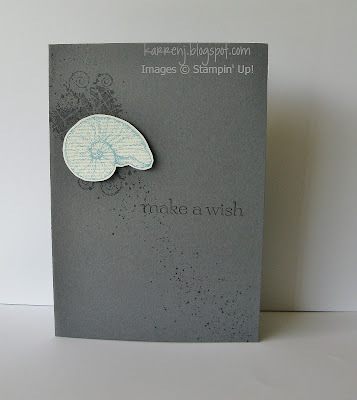 The challenge at Just Add Ink this week got me pulling out my Summer Starfruit cardstock for the first time. It goes really well with Basic Gray and Whisper White. 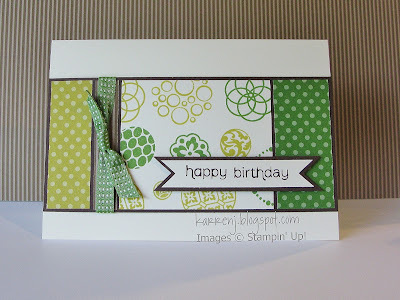 I used last week's sketch from Simply Stampin' Challenges to come up with a very simple birthday card. I punched circles out of the Basic Gray papers from Twitterpated and also the Neutrals DSP. I popped the sentiment circle up on Dimensionals and also added a bit of Summer Starfruit ribbon. The sentiment is white embossed. 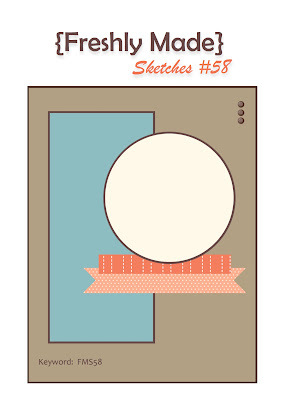 As it's a lovely Spring day today, I went summery with my card for the challenges at Freshly Made Sketches and Dynamic Duos. Even though I'm not a fan of orange, I do quite like Tangerine Tango. How come then, that I never use it? Because I wanted to keep my card light, I went with Bakers Twine rather than the panel across the top. 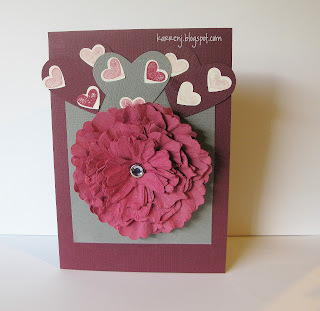 I used the Blossom Builder Punch and Build a Blossom set to make the flower. I realize that in nature green flowers with an orange center would be a rare sight, but I took some artistic license here LOL. 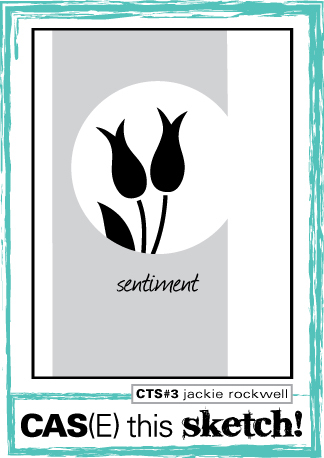 Edited to Add: This card was chosen as one of the Dynamic Darlings this week. Thanks, guys! 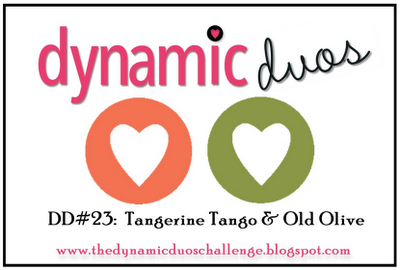 Here is my submission for this week's Dynamic Duos color challenge. I chose to pair up Cherry Cobbler with Crumb Cake and make another Christmas card. I also used last week's sketch from Freshly Made Sketches. 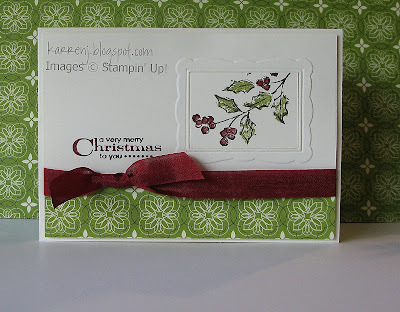 I stamped and white embossed the snowflakes onto the Cherry Cobbler card, then sponged round the edges with Cherry Cobbler ink. I then lightly spritzed the layer with Vanilla Smooch Spritz, which gives the piece a look of snow falling in the background (in my mind, anyway LOL). 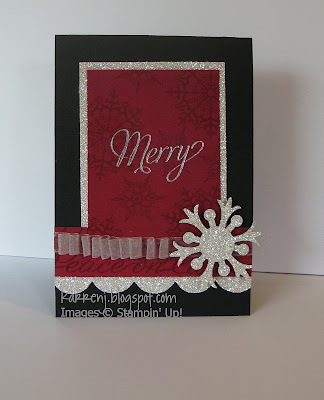 The snowflake embellishment is made using the two smallest dies in the new Snowflake Bigz die, with the smallest die cut at the back. 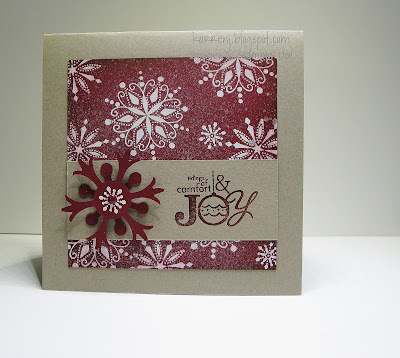 On the bigger die cut, I white embossed the smallest snowflake and then used a Cherry Cobbler brad to hold it together. 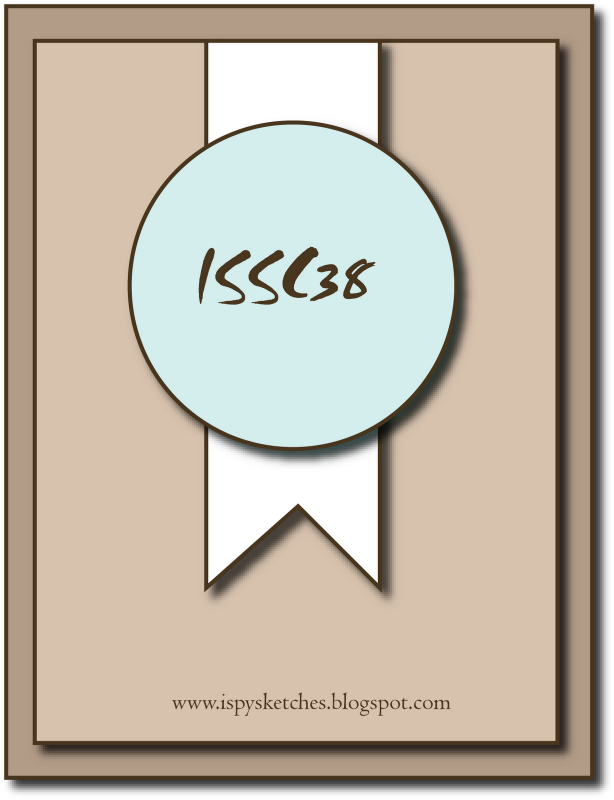 The sentiment is stamped with Cherry Cobbler ink and clear embossed. As I mentioned in an earlier post, I managed to persuade my DH that moving my stamp room from the 4th bedroom to the formal lounge was a good idea (I can be very persuasive LOL). The boys had been using the formal lounge as their games room, ie Playstation, etc and a place to store their junk. My argument to swap rooms played on the fact that I'd be doing everyone a favour to take over the big room so that the boys had a smaller room to mess up. Well, blow me down, but that argument worked! Our 4th bedroom is downstairs with the living areas, but is only 3.5m square (about 11.5' to my imperial readers). The formal lounge is considerably bigger at 6.0m x 4.1m (20' x 13.5'). Unfortunately not all the furniture from the lounge was going to fit in the new games room so the 3-seater couch remains in the lounge. As well, there's a pile of "stuff" in one corner that we still need to find a home for and boxes and boxes of Lego that need putting in the attic for the grandkids we'll hopefully have one day in the very distant future! This first photo is the view from the doorway. 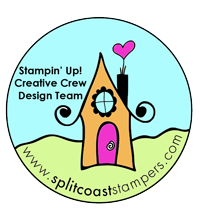 My desk is in the center of the room so that my son can sit on the other side and stamp which, now that he's 10, happens less frequently. You'll see under my desk that I have to keep my rubbish tin up out of the puppy's way. Ask me how I learned that little lesson LOL. 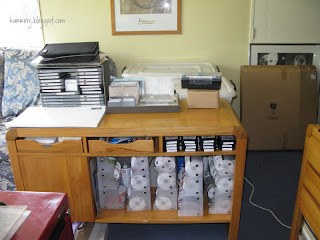 This photo is to the left of my desk and is of the credenza which matches the rimu desk I scored from work many years ago. 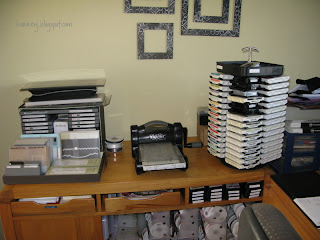 This is where I store my Big Shot dies and machine as well as my current inkpads. 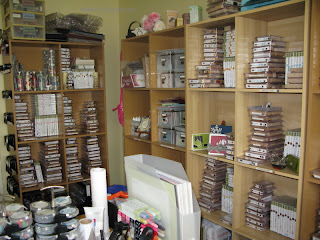 Underneath are all my ribbon holders and a few drawers for envelopes and catalogues. 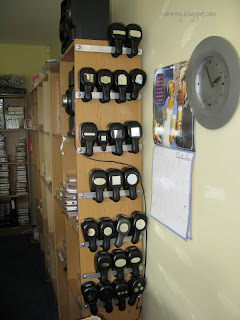 This photo is to show my old style punch storage. 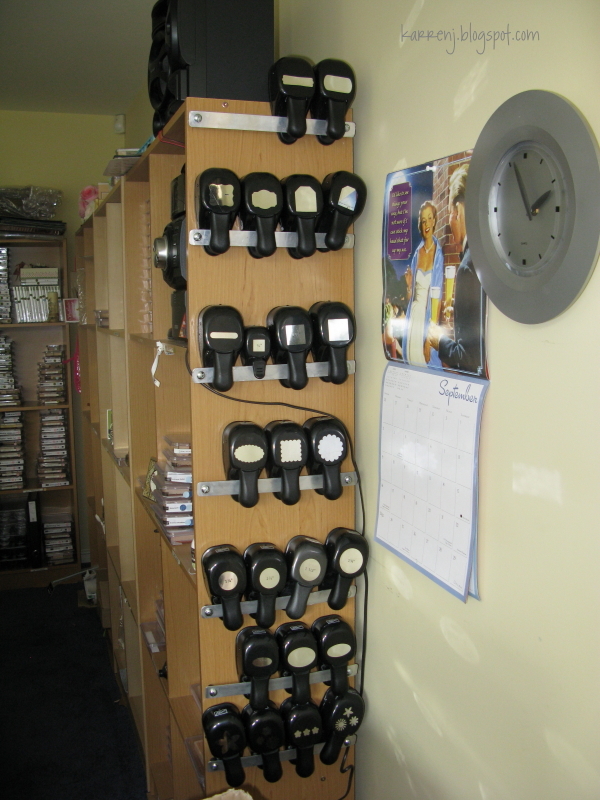 My darling DH made these holders for me, using some metal strips (exactly like a metal ruler), long screws and some rubber lugs to keep them out from the ends of the bookcase. I have these on the ends of two bookcases. 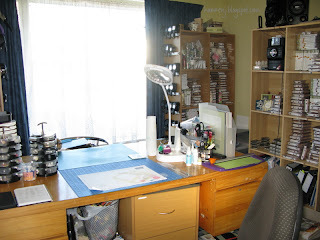 This is just a close-up photo of my desk - pretty clean and tidy for once. A front-on view of my Big Shot area. 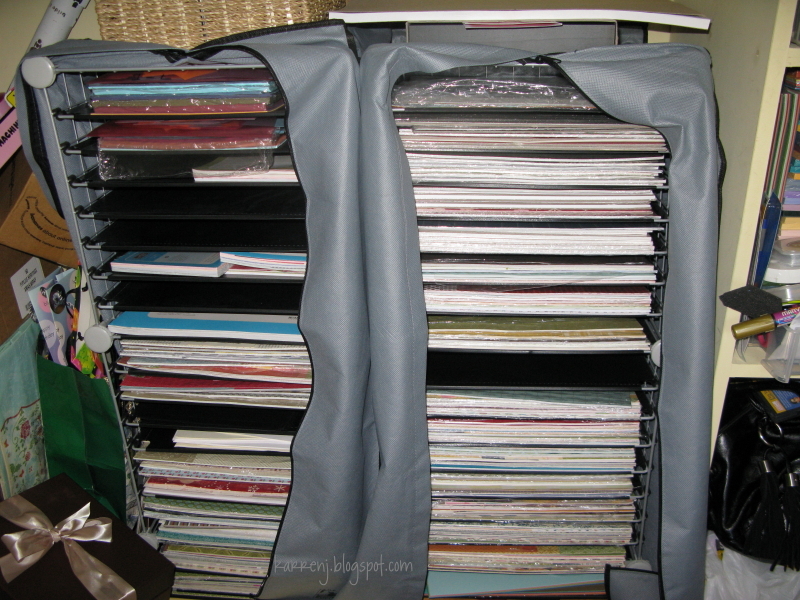 At the moment I only have one of the Big Shot storage boxes, so I took the dividers out and use the base on its side for my Bigz dies and the lid with one of the dividers in it for my embossing folders, framelits etc. As an aside, the artwork on the wall in this photo is something I found on Pinterest and made using foamboard and Night and Day DSP. 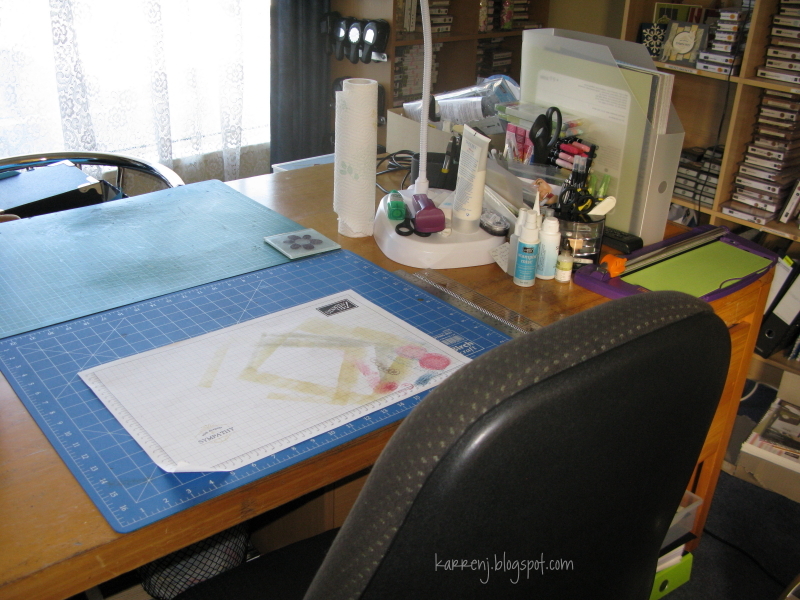 Excuse the mess on either side of these 12x12 paper holders. They were in the closet. 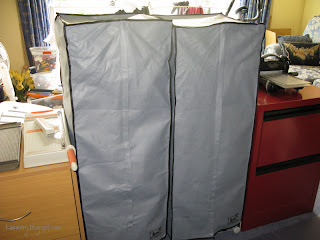 These are great for storing my DSP and the protective covers keep them shaded from the light. Unfortunately you can't move them with all the paper in - so I had to painstakingly unload each shelf before I could move the units into my new room. The paper didn't go back in the same order, so a job I need to do is sort out all my DSP again. Oh joy! So that's my old room. Now here are some photos of my new room. This is the view behind my desk looking towards the white double doors. On the other side of the doors is the kitchen/dining/family room, so I can open the doors while I'm stamping and still know what the rest of the family is up to. I had to keep the desk in the center of the room because William still insists on his side of the desk for stamping - even though he rarely uses it now. 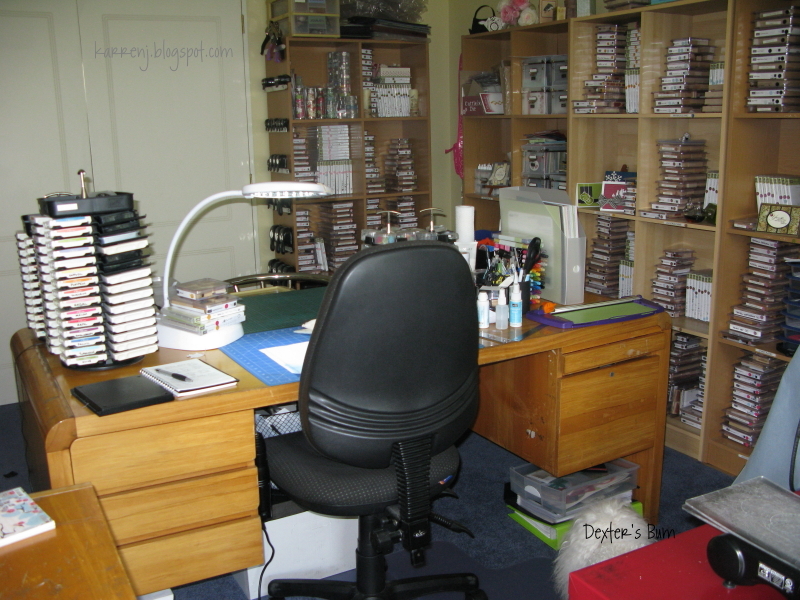 But I have more space around the desk which makes moving around much easier. Our Bichon puppy, Dexter, managed to get his bum in this picture! 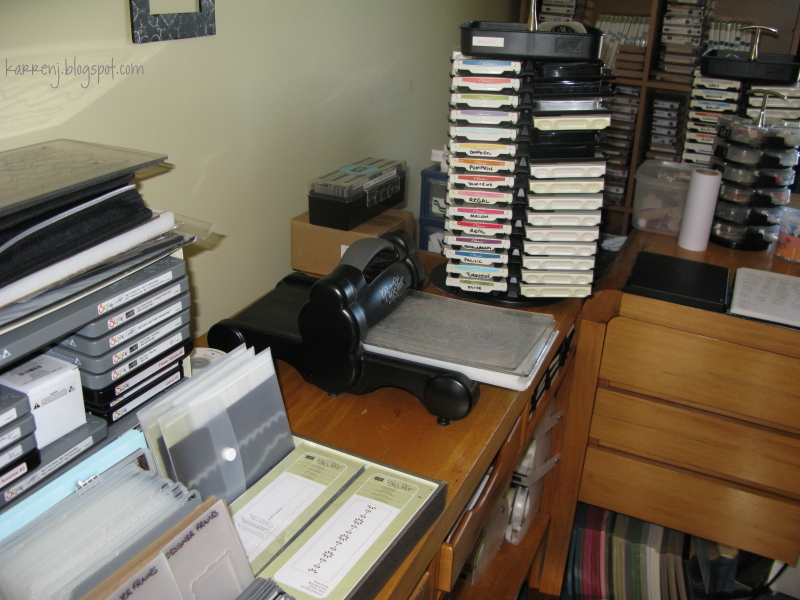 Behind my desk I have my A4 cardstock in the red filing cabinet; my 12x12 in the 2 paper holders I showed you before and to the left of that is another 2 drawer filing cabinet I use for extra cardstock, plus my receipts, etc. The top of that has become my storage place for my Tonic cutter and Simply Scored. I've also spread out my Big Shot stuff a bit and am using the top of the red filing cabinet for my Big Shot machine. 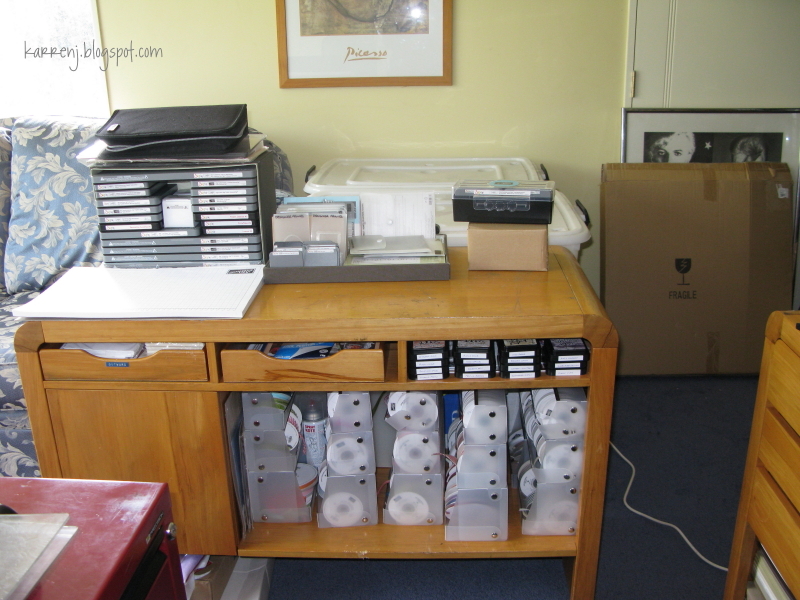 Behind this row of storage are the remains of the old "lounge". Some of the stuff I need to find another home for and some will stay here. It's probably about 1/3 of the whole room. On the left of the desk is my credenza, with all the same stuff in and on it as the other room, excluding the Big Shot. 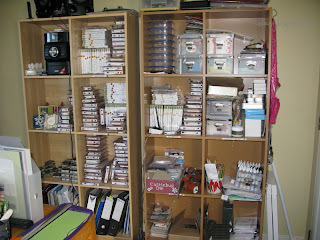 Behind the credenza are 4 huge plastic tubs with my rarely used stamp sets. 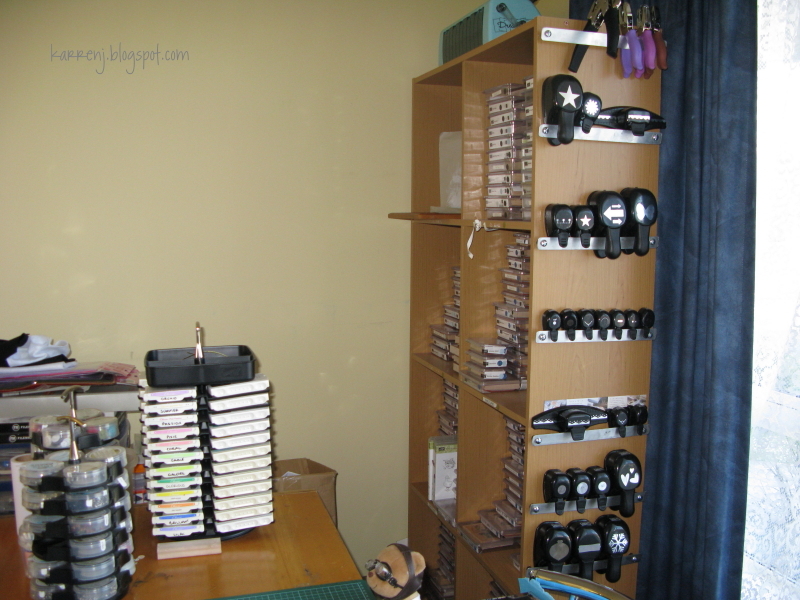 All my non-Stampin' Up stamps are still stored in the cupboard under the stairs. I would like to move them into this room, but not sure where to put them, as I have hundreds of them (yes, I'm a collector LOL). A view of 3 of my 4 bookcases. I still need to work out how best to position things for ease of use, but that will come with time and use. I don't make 3-D items very often because I find I don't know what to do with them when I do make them, so the few things I've made are on top of one of the bookcases. Extra wheel storage boxes are on another. Another view of my punch storage. So that's it. My new room. 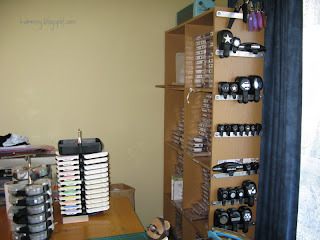 It's a bit hard to get the space difference in perspective but trust me, I have way more space, so I'm a happy stamper!